Fall is my favorite season of the year….the hot Florida sun is not as angry and the cool evening breeze makes being outside enjoyable again. I also love to decorate my home for the season too. PartyLite, “the largest direct seller of candles, candle accessories and home fragrances” offers tasteful seasonal decorations for your home and has a new Autumn and Halloween line to get you in the mood for fall. The “Change-O-Luminary” immediately caught my eye because it was not only beautiful but will work throughout the fall and winter season with the interchangeable motifs. 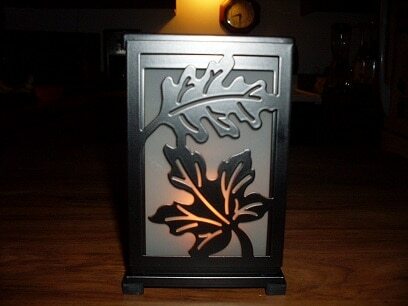 We immediately attached the “Autumn Leaf” panels and lit the votive candle. My husband and I enjoyed a glass of wine and spent an evening sitting outside chatting with the night lit up softly by our “Change-O-Luminary”. 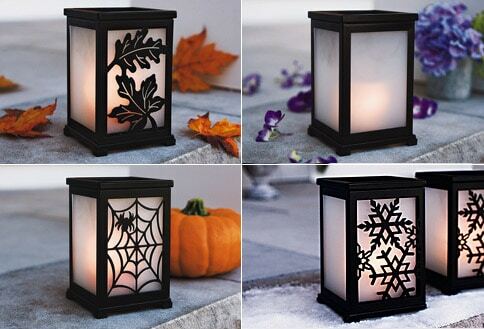 My children can’t wait for Halloween to get closer so we can change out the panels to the “Spooky Spider Web” and then finally the “Delicate Snowflakes” for winter. 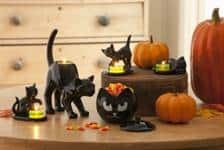 PartyLite offers an amazing selection for Fall and Halloween decorating, from the Autumn Pumpkin Aroma Melts Warmer to the adorable Halloween Cat Family. There is something for every decorative taste and PartyLite is ready to make your 2010 Fall and Halloween the most stylish and aromatic season ever. Visit PartyLite to learn more. Find PartyLite on Facebook and Twitter.